1. A furnace or hearth where metals are heated or wrought; a smithy. 2. A workshop where pig iron is transformed into wrought iron. a. To form (metal, for example) by heating in a forge and beating or hammering into shape. b. To form (metal) by a mechanical or hydraulic press. 2. To give form or shape to, especially by means of careful effort: forge a treaty; forge a close relationship. 3. To fashion or reproduce for fraudulent purposes; counterfeit: forge a signature. 1. To work at a forge or smithy. 2. To make a forgery or counterfeit. 1. To advance gradually but steadily: forged ahead through throngs of shoppers. 2. To advance with an abrupt increase of speed: forged into first place with seconds to go. 1. to form by heating and hammering; beat into shape. 2. to form or make, esp. by concentrated effort; fashion: to forge a treaty. 3. to imitate (handwriting, a signature, etc.) fraudulently; make a forgery of. 5. to work at a forge. 6. a fireplace, hearth, or furnace in which metal is heated before shaping. 7. the workshop of a blacksmith; smithy. 1. to move ahead slowly; progress steadily. 2. to move ahead with increased speed and effectiveness (usu. fol. by ahead). - Comes from Latin fabrica, "trade, workshop" or "fabric," and it first meant "smithy" or "manufacture." See also related terms for manufacture. 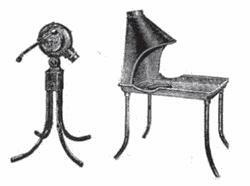 A small, open furnace that burned coal and was supplied with forced air from a bellows or handoperated blower. The forge was used by blacksmiths to heat iron enough (generally a red heat) to be shaped or welded. The left item in the illustration is a blower. To the right is a forge. Air from the blower was piped to the bottom of the forge so it could flow up through the burning coal. furnace - an enclosed chamber in which heat is produced to heat buildings, destroy refuse, smelt or refine ores, etc. Verb 1. forge - create by hammering; "hammer the silver into a bowl"; "forge a pair of tongues"
hammer - beat with or as if with a hammer; "hammer the metal flat"
foliate - hammer into thin flat foils; "foliate metal"
dropforge - forge with a dropforge; "drop-force the metal"
2. forge - make a copy of with the intent to deceive; "he faked the signature"; "they counterfeited dollar bills"; "She forged a Green Card"
3. forge - come up with (an idea, plan, explanation, theory, or principle) after a mental effort; "excogitate a way to measure the speed of light"
4. forge - move ahead steadily; "He forged ahead"
6. forge - make something, usually for a specific function; "She molded the rice balls carefully"; "Form cylinders from the dough"; "shape a figure"; "Work the metal into a sword"
7. forge - make out of components (often in an improvising manner); "She fashioned a tent out of a sheet and a few sticks"
make - make by shaping or bringing together constituents; "make a dress"; "make a cake"; "make a wall of stones"
tie - make by tying pieces together; "The fishermen tied their flies"
craft - make by hand and with much skill; "The artisan crafted a complicated tool"
tailor-make, sew, tailor - create (clothes) with cloth; "Can the seamstress sew me a suit by next week?" 1. form, build, create, establish, set up, fashion, shape, frame, construct, invent, devise, mould, contrive, fabricate, hammer out, make, work They agreed to forge closer economic ties. 2. fake, copy, reproduce, imitate, counterfeit, feign, falsify, coin They discovered forged dollar notes. 3. create, make, work, found, form, model, fashion, shape, cast, turn out, construct, devise, mould, contrive, fabricate, hammer out, beat into shape To forge a blade takes great skill. forge ahead progress quickly, progress, make headway, advance quickly He began to forge ahead with his studies. assemble, build, construct, fabricate, fashion, frame, make, manufacture, mold, produce, put together, shape. She tried to forge his signature → Elle a essayé de contrefaire sa signature. Moreover, the ship's forge was ordered to be hoisted out of its temporary idleness in the hold; and, to accelerate the affair, the blacksmith was commanded to proceed at once to the forging of whatever iron contrivances might be needed. Joe's forge adjoined our house, which was a wooden house, as many of the dwellings in our country were - most of them, at that time. People are put in the Hulks because they murder, and because they rob, and forge, and do all sorts of bad; and they always begin by asking questions. In time of war every Nome left his forge or mine and became part of the great army of King Roquat. When they were not required as soldiers all these Nomes were metal workers and miners, and they had hammered so much at the forges and dug so hard with pick and shovel that they had acquired great muscular strength. We will say that he was unexpectedly found at his forge again. Coming to the workshop, she saw the lamp burning on the forge, and everything as Sim had left it. Having filled this instrument with a quantity of small coal-dust from the forge, she approached the door, and dropping on one knee before it, dexterously blew into the keyhole as much of these fine ashes as the lock would hold. Go, then, and take the waters of Forges, or any that may be more agreeable to you, and recuperate yourself as quickly as possible. Instead of taking the waters of Forges, I go and take sea waters; I am free to do so. To increase productivity, we can use two presses, which will gradually forge every two strokes.